My pledge was to make a yellow coat for Esme, or a circular skirt from Neoprene. Embarrassingly I posted both these proto-projects on the blog; then procrastinated. When nothing much happens I find there is usually an underlying emotional conflict. In truth I find it really hard to make clothes for close relatives, mainly because I fear rejection. Those of us who make things for our families put a lot of love and time into selecting a pattern, and fabric, then making it up, and trying to make sure it fits really well. We want them to love the jumper/hat/skirt/jacket. We probably fantasise that the item will become a favourite that is worn continually until it gets holes in it. “This velvet jacket? Yes – I love it! My Mum/Granny/Auntie made it for me…”etc. Conversely if they don’t like or won’t wear the item, we may feel hurt. I know I do, and I know it is my problem. But it tends to mean I avoid making things for those I love. Quite deliberately I chose to deal with this issue as my Made Up challenge. Making things for others can be fraught with danger! My daughter’s “style” seems to change monthly, and my grandchildren prefer to wear as few clothes as possible. Did he choose the styles/patterns himself, or do you know what he likes and extrapolate? I have a funny relationship with my family who want me to “make me something” but don’t really know what they want until it exists, then they have really strong feelings. At present my daughter has asked for a skirt and I am scared to make it in case she doesn’t like/wear it. How do you deal with this? CCL generous gave me a full reply which you can read for yourself. In summary she suggests that when loved ones don’t wear the item it may be because they don’t want to ruin it, or because it doesn’t actually turn out how they envisaged it. I don’t think my children worry too much about getting a (ahem) patina on their outfits. But I do think she has a point about being able to “see” the garment in your imagination before it is made. This is why so many people now use Pinterest, or similar, to capture a picture of something that they want. The younger generation have their own ideas about what looks good, which are just as valid as ours. With my daughter I find we clash quite often on style issues, but I really respect her opinion which she expresses with the confidence of the instinctively cool. In an ideal world collaboration may be the best approach. Made Up gave me a chance to experiment with consultation and engagement (a technique that I have learned in the workplace). We collaborated on this project, sharing some of the work. It started with her emailing me a photograph of a brightly coloured, neoprene skirt. I decided it was probably a full circle skirt, mid thigh length, made from fairly stiff neoprene, possibly supported by a petticoat. I was keen to get the fabric and colours just right. This wasn’t possible, so I considered painting heavy silk and backing it with something fairly substantial. I blogged about it and got some very useful advice. Then I procrastinated. Actually when I found some inexpensive stretch cotton in Simply Fabrics Esme declared it was “exactly” what she wanted. The colour scheme is similar but it is not neoprene. We then set out to design the skirt together, and to my surprise Esme asked for it to be knee length. I had also assumed a wide waist band, and instead she chose a 1″ one. Most significantly the skirt droops rather than standing proud. So the eventual skirt does not look that much like the picture. But it is “inspired by” the neoprene skirt, and it does look very pretty. In addition Esme did most of the cutting out and sewing herself, including putting in a perfect invisible zip. As I had struggled with putting a zip in a skirt for myself just the previous day (six attempts, and still not right), I couldn’t believe how well she had done this. I did the waist band, hook and bar and the hem. I have fulfilled the promise I made to Karen. But there remains the matter of the yellow coat. Beautiful. Lovely colours and it is just the right length for Esme. I agree about making clothes for family. I have knitted for close family and made household items also for them but only sewn for the grandchildren. I find fitting difficult enough for myself and it would be impossible for anyone else. I did make a safari type suit for my husband in the 70’s and he liked it but no photos exist so I don’t remember whether it was good or just a good memory. It is a beautiful skirt for your beautiful daughter. I have been very pleasantly surprised that my daughters wear the clothes I have sewn them being fashion conscious teenagers and young women. However they did choose the fabrics and patterns. I think they know too it is a labour of love .You have the priceless addition of having a wonderful bonding experience with your daughter . The skirt is lovely. It is hard to get things right for other people. Usually it comes down to communication. First issue is whether the person has tried on a garment in the style they think they would like. We can all imagine that we’re going to look like the model in the photo, and then realise that we picked the wrong shape or colour. Second issue is availability of fabric, and trims. Often it’s the print or the curved zip, or some other unreproduceable aspect of the garment which is the stumbling block. I can make for one daughter, because she will involve herself in the process, fitting, picking fabric, saying exactly what’s wrong if it doesn’t work. Another daughter is a nightmare to make for – I know when I start that it will be another garment shoved at the back of the wardrobe. Funny thing about Pinterest, it seems so logical for clients/relatives to show you exactly what they want but you have no idea what actually drew them to it in the first place. It could be the color or shape of the feeling of freedom and gaiety or youth…who knows. The fact that the skirt ended up knee-length with a narrow waistband says it all…the inspiration was there in some form but it translated to something more practical and wearable with some longevity. With clients there is also a trust issue, they do believe you can sew well but will the finished garment look perfect in their mind and hanging on an imperfect body? We doubt ourselves when starting a project after selecting the perfect pattern with perfect sketches and perfect fabric because it doesn’t always come together for some reason. In this case, the smile on your daughter’s face says it all! She looks stunning! The skirt is lovely, and I really like the colours in the fabric. Family are much more difficult to sew for than clients in this respect. Clients have no concerns about saying exactly what they want. I love sewing for my daughter but finding out just what she would like is like pulling teeth! This made me reflect on the experience of being sewn FOR by my very skilled seamstress mother…..as a very little girl I remember a wonderful wardrobe of dresses with fitted bodices and full skirts such as girls wore to school then. I ALSO remember the stress of picking one to wear each day – there was frequently a big favorite of mine that I wanted to wear a lot and something else that my mother preferred that I wear, so the “picking” seemed fake to me even as a child, with attendant resentment on both sides to start the day! Later on there was a lot of conflict around the very short skirts that were in style vs what my mother saw as “decently covered” – that was addressed by telling me I had ugly legs that needed more concealment. I am surprised every time I see a picture from that era to see that I DIDN’T have ugly legs (and I am still 40+ years later careful to conceal my “ugly legs” – which have not aged as beautifully as I might have hoped). Perhaps as a result of all this I almost never sewed for anyone but myself (altho I do make my mother pajamas and housecoats, which she wears into rags) – my boys had little cotton elastic waist shorts until they got to be 6 or so and wanted another style, but after that, no. As you can see this was an evocative post for me. Esme looks beautiful, doesn’t she? And the zipper story…..! How nice to have a great success! Wow! She looks terrfic in that outfit! What a lovely skirt. I love the fabric and the style looks great on her. Funny, as just yesterday my daughter asked me to make her some skinny denim stretchy high waist pants. I was thrilled she asked… Hoping for the bonding fun of it all. This is great advice right when I need it. I’ll be sure to let her shop for the fabric, help with the sewing. And we will do it together. My husband is always asking me to make him something, but I haven’t yet ( well once I made him a hat and he didn’t wear it) …. I really ” should” try once more with him too. He is retired now, maybe he could cut it out. No promises cause I am hearing little voices in my head that are saying ” don’t go there”. Ha. Anyhow Kate this is a huge success in my opinion. Thanks for sharing and I was so hoping to see a photograph of Esme wearing it. She looks fantastic! Looking forward to the yellow coat….fingers crossed for you both. Love this a lot. A great collaboration. I’m trying to figure out how you spaced the pleats, as it seems as though there is a wider middle one. I love this kind of skirt – the length and the subtle waistband. Ack! I see it’s actually a circle skirt! Yes it is Stephanie – a full circle. I used the circle skirt calculator on By Hand London. It is perfectly accurate and so quick – I think Esme will make more of these – in wool with a lining it would be a great winter skirt for work. The made up version is even better than the inspiration! It looks great on her, and as others have mentioned, will be so much more versatile. I love the fabric, and love that it was a collaboration. I have a love/hate relationship with sewing for family. My daughter generally likes and wears what I make for her, but she is very involved in the process. My husband and son complain that they are left out, but rarely wear what I make, so I don’t have much incentive to sew for them. Anyway, nice ending to the story! The first two (requested) dresses I made for my youngest daughter, that she wears to death, were chosen by her, fabric and all. She had clear ideas of what she wanted. Now that she has started to sew, I’m looking forward to seeing what she creates. She gave me a list of what she’d like me to make. I’m making her a skirt at present and after she tried on the toile was surprised that she wanted it longer – a sign both of age and the length of time it’s taken me to get around to it! My other two daughters are not terribly interested. I sew for them all, and DH, as much for my own benefit – but it’s nice when it’s appreciated. Looks beautiful on Esme. I think she could also get away with a shorter version as well. She’s still young enough and has great legs too. The colour is fab and great Esme contributed so much to the project. Looks wonderful on her. Not exactly like the photo but definitely “inspired by.” I’ve been shown photos of a dress, told it was “exactly what I want” and wound up with something quite different after a muslin fitting. Maybe part of the problem in sewing for family/friends is that they envision the garment differently than it is described to you. 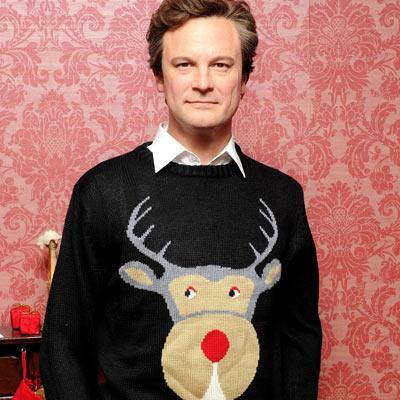 First of all, any post with a picture of Colin Firth (in a reindeer sweater, no less) has to be great. And it didn’t disappoint. Since I’m just starting up with the sewing again at a late date, my children are grown (and so far away)…..maybe grandchildren will be recipients? Love your gorgeous daughter’s inspiration skirt. Love the “real deal” even more! So soft, lovely colors, happy smiles. Perfection. Great skirt and very elegant. Definitely a more wearable skirt than the original inspiration. Goodonya Esme, you look tres chic in your handmade.